The domain within your query sequence starts at position 360 and ends at position 433; the E-value for the SAND domain shown below is 3.55e-28. Proteins containing the SAND domain have a modular structure; the SAND domain can be associated with a number of other modules, including the bromodomain, the PHD finger and the MYND finger. Because no SAND domain has been found in yeast, it is thought that the SAND domain could be restricted to animal phyla. Many SAND domain-containing proteins, including NUDR, DEAF-1 (Deformed epidermal autoregulatory factor-1) and GMEB, have been shown to bind DNA sequences specifically. The SAND domain has been proposed to mediate the DNA binding activity of these proteins [(PUBMED:9697411), (PUBMED:11427895)]. The resolution of the 3D structure of the SAND domain from Sp100b has revealed that it consists of a novel alpha/beta fold. The SAND domain adopts a compact fold consisting of a strongly twisted, five-stranded antiparallel beta-sheet with four alpha-helices packing against one side of the beta-sheet. The opposite side of the beta-sheet is solvent exposed. 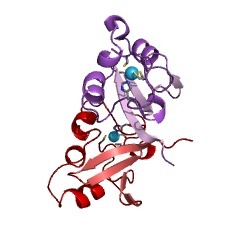 The beta-sheet and alpha-helical parts of the structure form two distinct regions. Multiple hydrophobic residues pack between these regions to form a structural core. A conserved KDWK sequence motif is found within the alpha-helical, positively charged surface patch. The DNA binding surface has been mapped to the alpha-helical region encompassing the KDWK motif [(PUBMED:11427895)]. 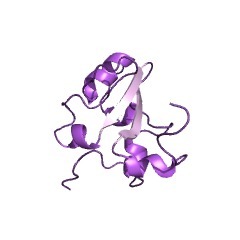 There are 2977 SAND domains in 2833 proteins in SMART's nrdb database. Taxonomic distribution of proteins containing SAND domain. This tree includes only several representative species. The complete taxonomic breakdown of all proteins with SAND domain is also avaliable. Click on the protein counts, or double click on taxonomic names to display all proteins containing SAND domain in the selected taxonomic class. 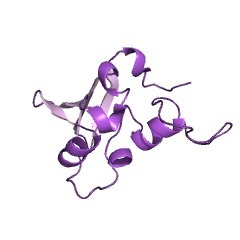 The APECED polyglandular autoimmune syndrome protein, AIRE-1, contains the SAND domain and is probably a transcription factor. 1h5p Solution structure of the human Sp100b SAND domain by heteronuclear NMR.